Chris Burke has been a part of the kitesurf industry for a long time! He was one of the original wakestyle riders pioneering the movement, riding boots and hitting rails and kickers. As an international rider with Liquid Force, he travelled the World competing, filming and doing some teaching and coaching in his down time. He spent a lot of winters in warmer climes learning everything you need to know about running a successful kite school. His next move was with Wainman, as a UK rep and R+D rider spending his winters in Maui developing kit and shooting promo material. After deciding he wanted to spend more time in the UK he set up Poseidon Kite School, and started building his client base. A few years ago when Chris decided to focus 100% on developing Poseidon, he needed a solid partner, and that was Ozone. We have teamed up with Poseidon to create an Ozone test centre in Poole – one of the most popular kite areas in the country. The school has developed into one of the largest in the UK, offering everything from powerkite lessons to 1 on 1 coaching. 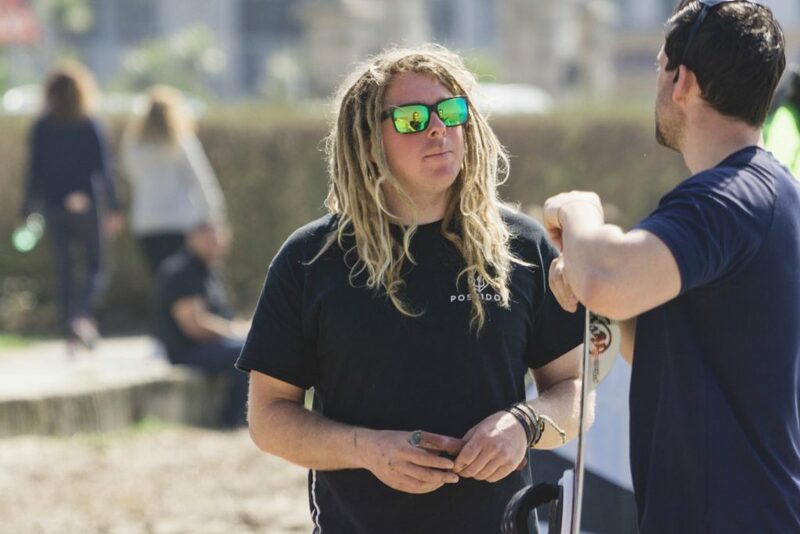 Poseidon has become a hub of the local kitesurf scene – offering daily weather updates on social media and regular social events. They also hosted our 2016 stop of the Ozone Global Demo Tour. I first tried kitesurfing in 1999. Growing up windsurfing and wake boarding, kiting came on the scene as a pretty sketchy new option which offered a whole new level of excitement through massive airs and a new freedom of tricks. My dad got us a kite and after a long time on land teaching ourselves the basics we hit the water for some hefty swims whilst we figured it out. It wasn’t a quick process, but I was hooked. After moving to the Isle of Wight and qualifying as an instructor in 2002 I ran with the sport as a career and never looked back. I have been focusing on developing Poseidon to become a premiere kite school for the last 4 years, my plan this year is to grow Poseidon’s accomplished rider services, taking our unique skills and company ethos to experienced riders everywhere, increasing the time me and the team get to ride ourselves too. Starting a UK tour, offering more advanced training, increasing our overseas trips, offering a shuttle service and developing our club benefits are all our way of welcoming kiters across the country to come ride with us. What do you like about Ozone? I choose Ozone for it’s feel, quality and product range. I love how every piece of kit excels in exactly what it’s designed for, offering amazing rider feedback, comfort, performance and an honest value for money. Seeing smiles everytime someone uses them, we’re seeing more success from newbies on the Catalyst than ever before. For hirers and our own sessions, knowing we’ve got quality kites in the line up – our excitement to ride never stops. Whether it’s waveriding the Reo, boosting the edge, popping the C4 or looping the Enduro, our confidence to go full bore never falters with Ozone. What sets you apart from other kite schools? We set ourself aside from other kite schools with our passion for the sport. Not just through the highest quality lessons, coaching and hire services we offer, but through the extras we put on for our customers and friends. We’re a lifestyle focused company who spend a great deal of time putting back into the kite scene and community. It’s close to our heart so helping someone launch, hosting an event, a social or a kite adventure is all part of the experience at Poseidon. We’re here to add to all levels of the kiting experience, not just a 1 stop shop. We welcome everyone to stay close after learning and ride together. Find out more about Poseidon Kite School. Edge, Enduro or Amp – Which is right for you?